Mexico City.– President Felipe Calderón declared that the elections are behind us now and that it is time to make agreements and act responsibly towards the country, because one of Mexico’s most pressing challenges is to reverse the impact of the international economic crisis. He repeated that his government is willing to engage in dialogue and collaborate with the new legislature, in order to meet the country’s challenges. “Now is a moment of understanding and agreement, particularly to maintain solid, overall conditions of macroeconomic stability, because this is what will enable us to cope best with the crisis, because they have established a crucial difference from other critical periods in the Mexican economy in the past,” he declared. 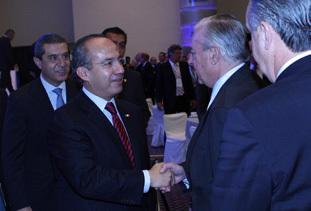 President Felipe Calderón reported that he will submit the 2010 Economic Package to the new Chamber of Deputies, in order for this legislature to analyze, discuss, enrich and where appropriate, approve it. “It is essential for both the legislative and the executive branch to work together to strengthen the state’s finances and preserve their stability and solidity,” he said. He added that it will be crucially important to advance towards promoting the agenda of economic competitiveness, in order to invigorate the labor market, improve the regulatory framework, increase fiscal efficiency and strengthen the atmosphere of competition in the country. The President therefore urged the country’s banking sector and the rest of the political and social actors to promote the changes Mexico needs and that the economy requires to grow at higher rates, and create more jobs and the well-being Mexicans demand. He congratulated BBVA Bancomer on continuing to bet on Mexico and investing 900 million USD in Mexico for the construction of two large corporate towers. He said that there have been sporadic, albeit incipient but encouraging signs that the international financial crisis may be drawing to a close and that the worst may soon be past. “There have been some signs in this respect, those green shoots people are talking about but there are also others that differentiate Mexico or the situation in Mexico from other situations in the rest of the world. For example, there is the question of unemployment. Although the unemployment rate in Mexico worries us and is high, it is still below levels recorded in other countries,” he said. Moreover, he said that, “The good news is that in our country, in Mexico, according to the registration data from the Mexican Social Security Institute, in other words, formal jobs paid for by worker-employees quotas in June not only failed to record an increase in unemployment but also recorded nearly 20,000 new formal jobs in the Social Security Institute in June.